ASA Pilots VFR Kneeboard. 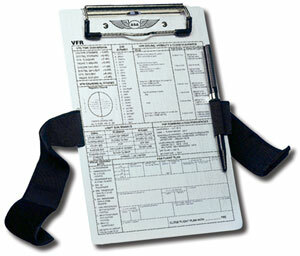 Durable brushed aluminum VFR pilot kneeboard. a strong surface for inflight note taking, as well as quick access to important VFR information in the form of a permanent placard. Pencil/pen holder within legband for fast note taking. The 4-3/4'' wide metal clip is easy to lift and strong enough to hold charts and other necessary papers. Kneeboard is 6-1/2'' wide x 9-1/2'' high.